A tranquil taste of the tropical south—juicy peaches, tangy citrus and a captivating floral finish. Fill a pitcher with cold water and White Peony Tea. Let the tea steep in the refrigerator overnight. While the tea is steeping, make an Raw Honey Simple Syrup by mixing one part honey and one part room temperature water. Whisk thoroughly until the honey and water combine. Honey Simple Syrup will keep indefinitely (refrigerated) & we always keep some on hand. When the tea is finished steeping, strain the tea. 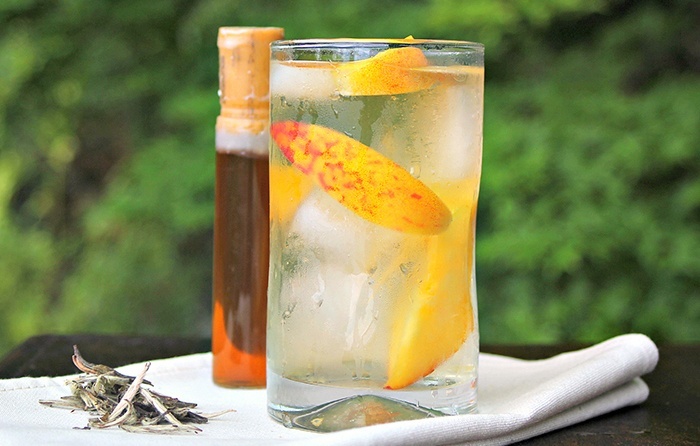 Add sliced peaches to the strained tea as garnish. Add Honey Simple Syrup to taste.